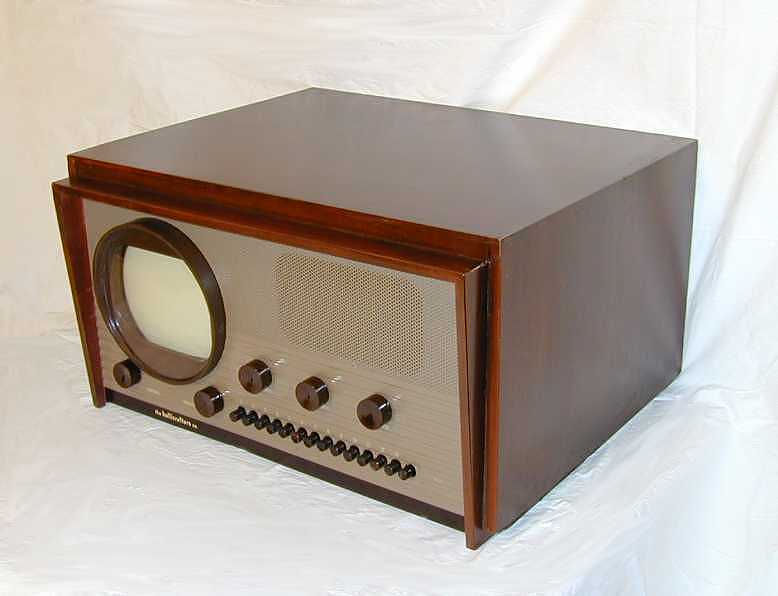 A striking early television, Hallicrafter's model 505 is unusual in several ways. One glance at the small picture tube and the 13 tuning pushbuttons (including Channel 1) tells you that this is no ordinary TV. The technology inside, as well as the external appearance, are notably different from modern sets. Hallicrafters introduced its first televisions in 1947, amidst an explosion of postwar electronic innovation. Although we may think of television as a fairly recent invention, the technology began to develop in the 1920s. 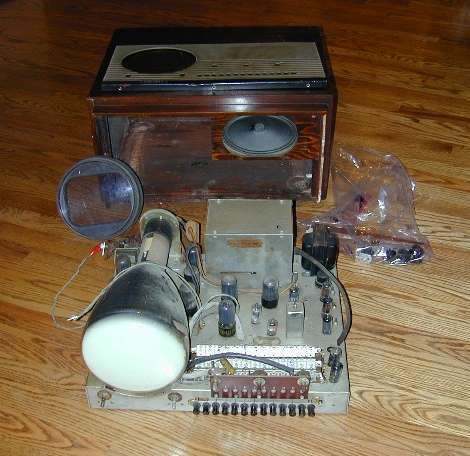 A special "Television Number" of 1928 Radio News Magazine described the early, electro-mechanical scanning disk television system. 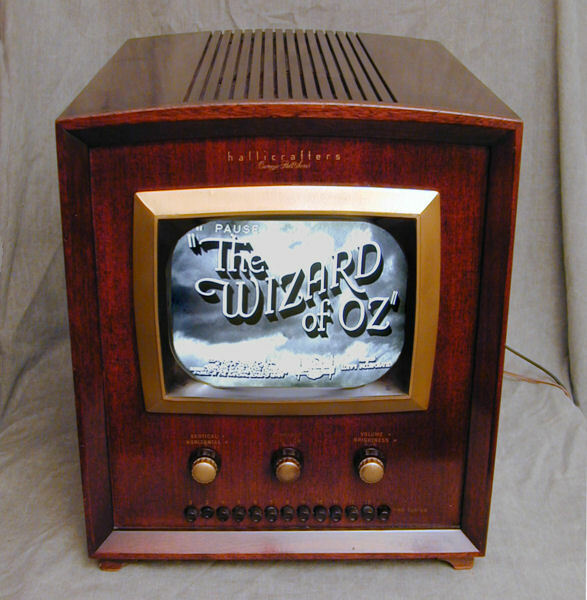 The development of the cathode-ray tube (CRT) enabled all-electronic television, with much larger and brighter picture tubes of the type used today. Experimentation continued throughout the 1930s, but the TVs of that decade were fantastically expensive and most people had no programs to watch! As late as 1939, there were only two TV broadcast stations in the United States. 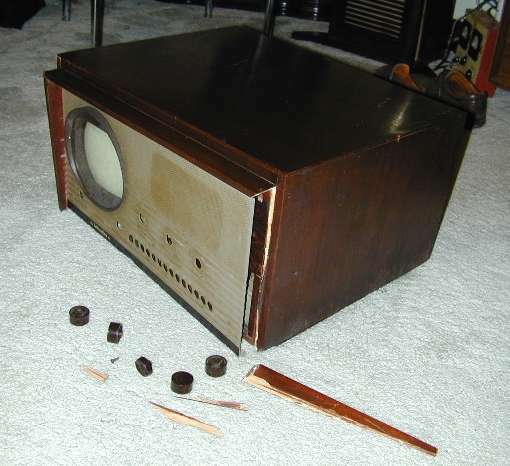 When the US entered World War II, there were only a few hundred televisions in the entire country, compared to tens of millions of radios. All of this was changing by the war's end. 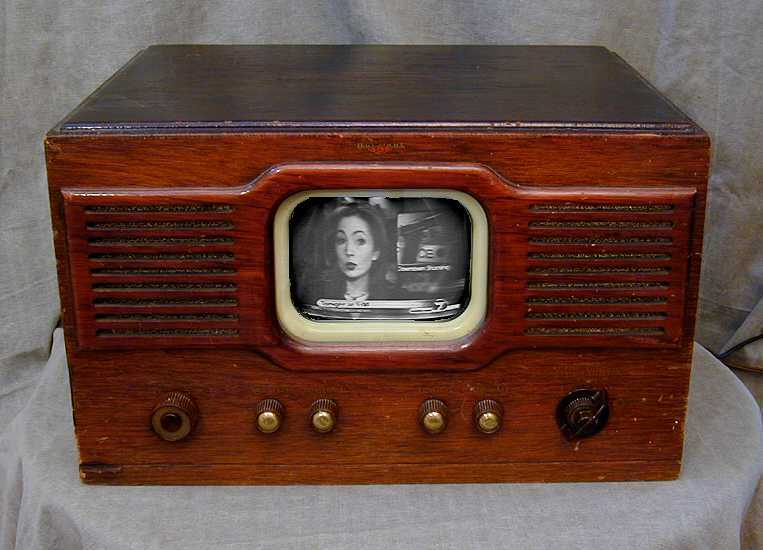 By 1946, the nation had adopted a single TV broadcasting standard, TV networks were springing into existence, and the refinement of all-glass miniature tubes made it possible to build more affordable TVs. By 1947, the number of TVs in the US had mushroomed from a few hundred to as many as 44,000. 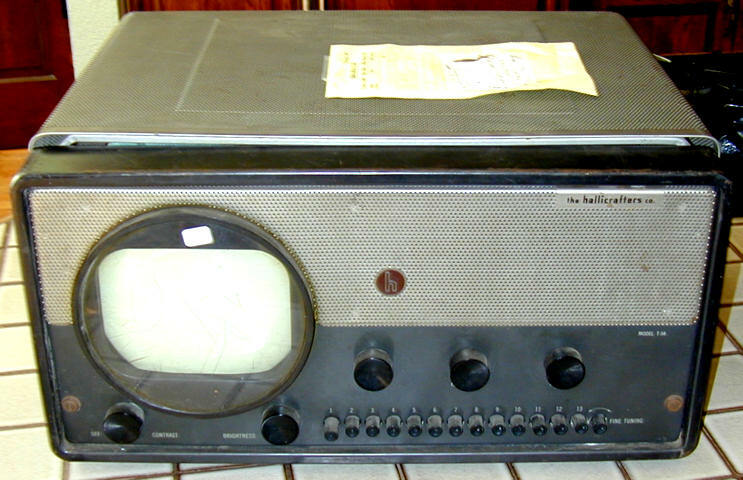 This encouraged radio manufacturers, including Hallicrafters, to enter the TV market. 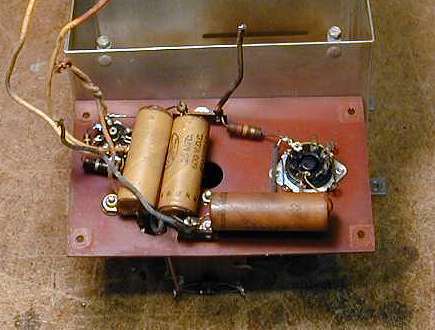 Introduced in 1948, Hallicrafters' model 505 was a typical set of the time, with a number of miniature tubes and a 7-inch electrostatic deflection picture tube. 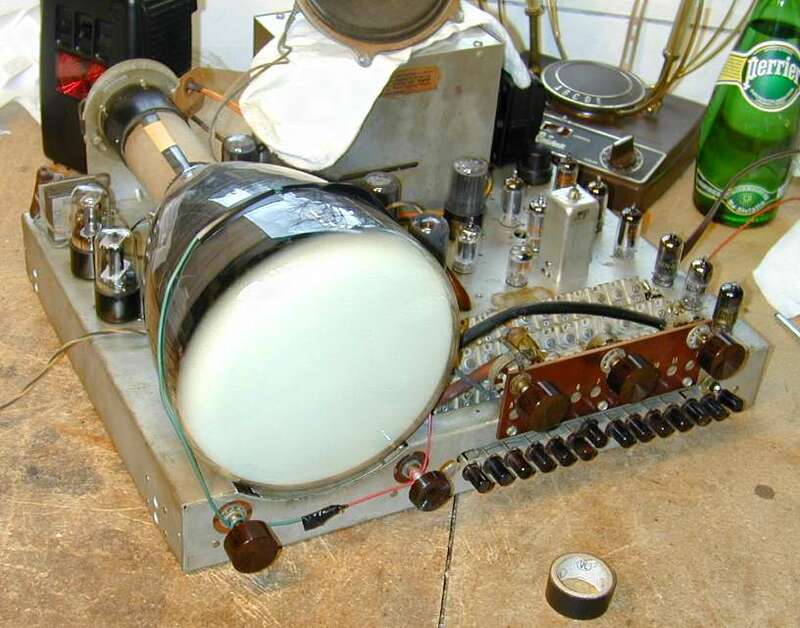 This type of picture tube was later superseded by the magnetic deflection type, which is still in use today. Model 505 has an attractive, mahogany colored wooden cabinet with a slightly flared trim in the front. Hallicrafters sold this TV in a few different cabinets. The first was model T-54, introduced in 1947. 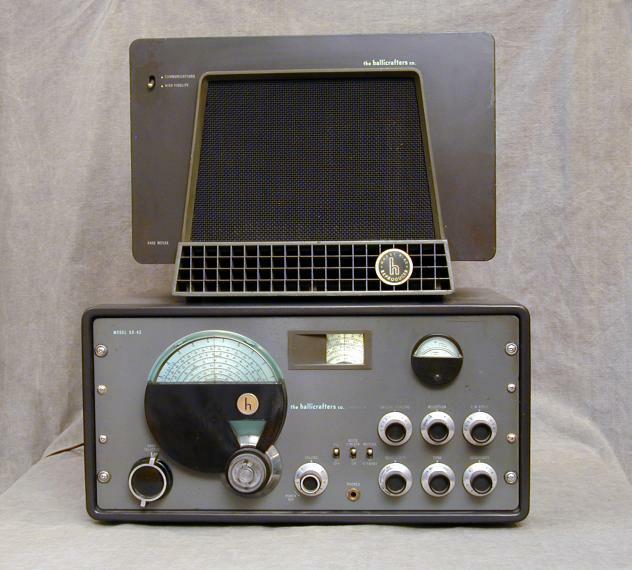 The T-54 came in the same grey metal cabinet as the popular Hallicrafters SX-42 communications radio. Raymond Loewy, the famous Machine Age designer, is credited with designing both of these sets. Below you can see my SX-42 radio and my unrestored T-54 and 514 TVs. Model 514 was sold as a portable—or at least ""luggable"—set with an oil-cloth covered wooden case and removable front cover. Model 506 (not pictured) was similar to the 505 but with small wooden feet on the bottom. Hallicrafters also licensed this television to retailers such as Sears and Montgomery Wards, so you'll occasionally see a "clone" of this set with another maker's nameplate. The 505's front panel is made of aluminum painted grey and beige, with ivory painted lettering. A thick brown rubber bezel cushions the round picture tube and creates a rectangular mask. Although picture tubes of the time were round, a television signal by its nature creates a rectangular picture. Most TVs of that era used such a mask, and you would normally adjust the picture height and width to fit the mask area. 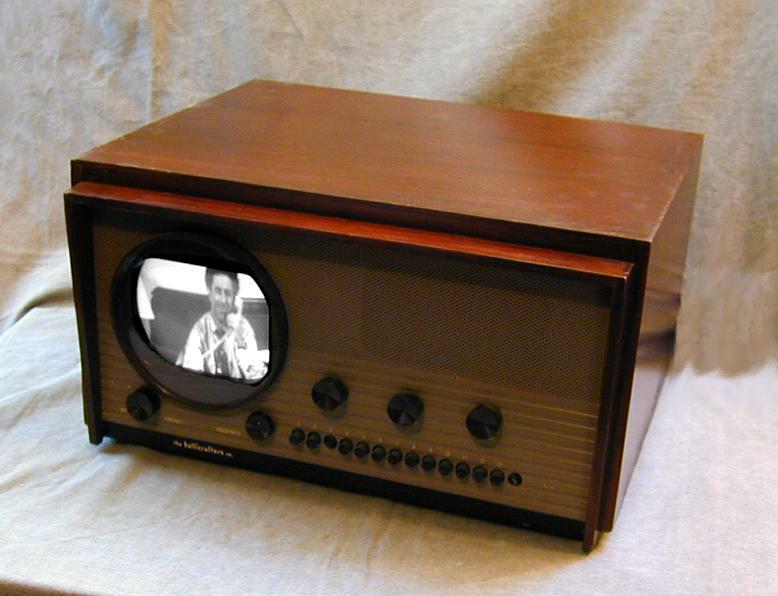 A "porthole" TV simply had a round CRT with no mask. On such a TV, you can expand the height and width to fill the entire CRT, but then the four corners of the picture will disappear off the screen. By the 1950s, manufacturers developed rectangular CRTs such as we use today, doing away with the need for such compromises. The leftmost control combines the power switch and contrast control, while the next knob to the right controls brightness. The three large knobs on the top adjust the volume, horizontal hold, and vertical hold, respectively. Below these is a row of fourteen pushbuttons, for selecting Channels 1 through 13. (Later models eliminated Channel 1 when that channel became obsolete.) 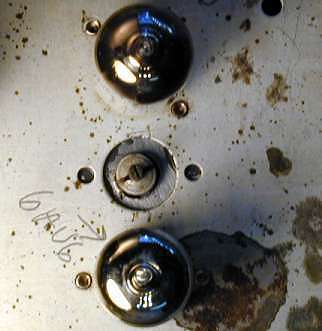 The rightmost "button" is a rotary fine-tuning control. The back panel of the TV provides five additional picture controls, to adjust focus, vertical and horizontal position, width, and height. This set was purchased as a Christmas surprise by my wife, but our first look at the set was not encouraging. The TV had been shipped across North America, from New York to Washington state. When I began to open the package and felt the small CRT in that distinctive position, I immediately guessed what sort of TV it was. Opening the box revealed that it had suffered shipping damage, however. Here is a view of the TV at that stage. Shipped without adequate packing, the front trim of the cabinet had broken away and shattered. Worse, most of the mounting brackets had broken loose from the chassis, allowing it to slide around in transit. The metal front panel was pushed forward, knocking off all the knobs and breaking off the fine tuning control. What a disappointment! The next photo shows the TV disassembled after unpacking. Despite the rough cross-country trip, the CRT and other tubes were unbroken and still in place. Everything else—at least to the casual eye—seemed to be present and accounted for. Rather than send it back for a refund, I decided to keep the set and restore it. I brought the cabinet to a furniture shop to repair the breakage. They determined that the cabinet had been broken badly before. Three of the four cabinet joints had been broken loose in the past—probably by dropping the TV on the floor—and then crudely glued together. A proper repair would require knocking the joints apart, cleaning off the old glue, and regluing everything. While the cabinet was off being repaired, I turned to the electronic work. When I initially tested the TV under power, all of the tube filaments lit up, but it seemed completely dead, with no sound and no hint of a picture. This didn't concern me too much, since most unrestored 55-year old TVs will perform poorly, if at all. V9 12SN7GT Video out/Sync sep./DC rest. There are two versions of the model 505, early and late. Mine is the late version. The early version uses eight-pin 6SH7 tubes in place of the seven-pin 6AU6 miniature tubes. Both types are electrically very similar, but the pinouts are different. 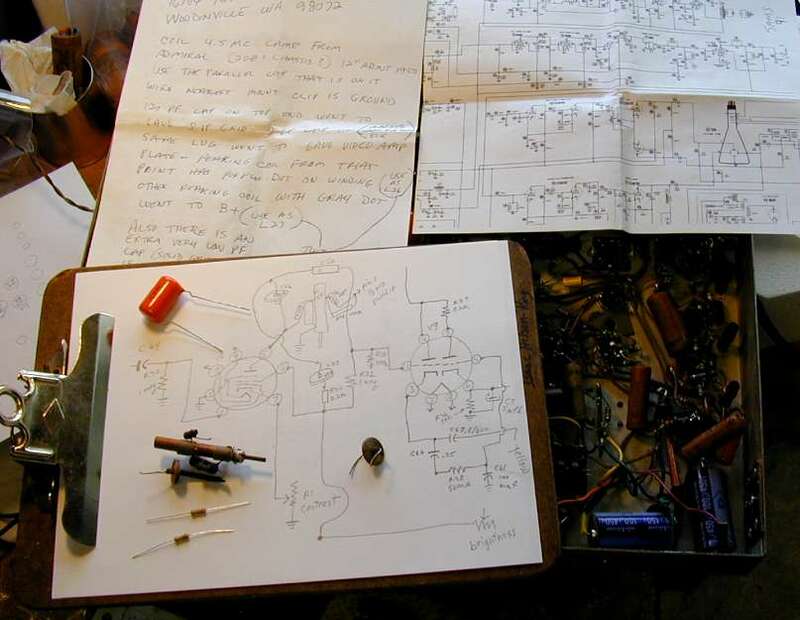 If you compare both schematics, you will notice other minor differences here and there, so it's important to get the right version; both are available from the Early Television Foundation schematic archive. 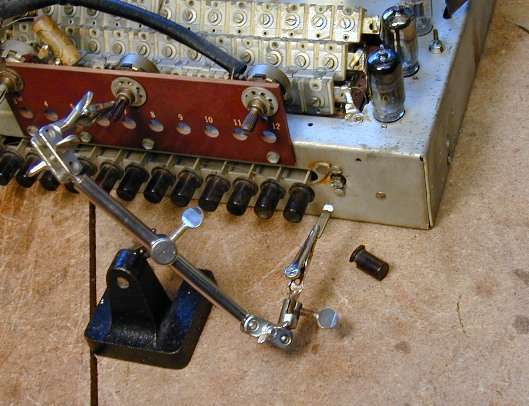 One of my first tasks was to repair the fine tuning control, whose metal tab had been snapped off during shipping. This was easy to solder back on, although it took a couple of tries to get it aligned straight. The 7-inch picture tube is not mounted very securely. It simply lies in a recess in the chassis, held in place only by its socket in the back, and by pressure from the rubber gasket in front. Before turning over the chassis, I strapped down the CRT by running wires around it and the two nearest controls, securing the wire with tape. If you don't do this, you risk breaking the CRT pins or the socket when you turn the chassis over. Another option is simply to remove the CRT while working under the chassis, but then you need to flip it upright and reinstall the CRT whenever you want to test it. Below is a first look at the underside of the chassis, with its many paper capacitors. In the upper left, you can see one of the four metal mounting feet still in place. The other three had been broken off their riveted phenolic chassis mounts, allowing the chassis to slide around in the cabinet. The next photo shows the high-voltage capacitor after removal, looming over its more compact modern replacement. 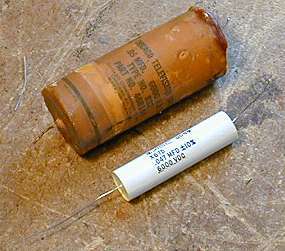 These capacitors are rated for 6000 volts, much higher than what is used in radio repair and most TV circuits. I was able to find replacements at Allied Electronics. After replacing the capacitors in the power supply and high-voltage circuits, I again tested the TV. As before, it had no sound or picture. Checking the low-voltage power supply, I found that it had reasonable B+ voltage. The filament supply was also reasonable. This TV, by the way, has no power transformer. 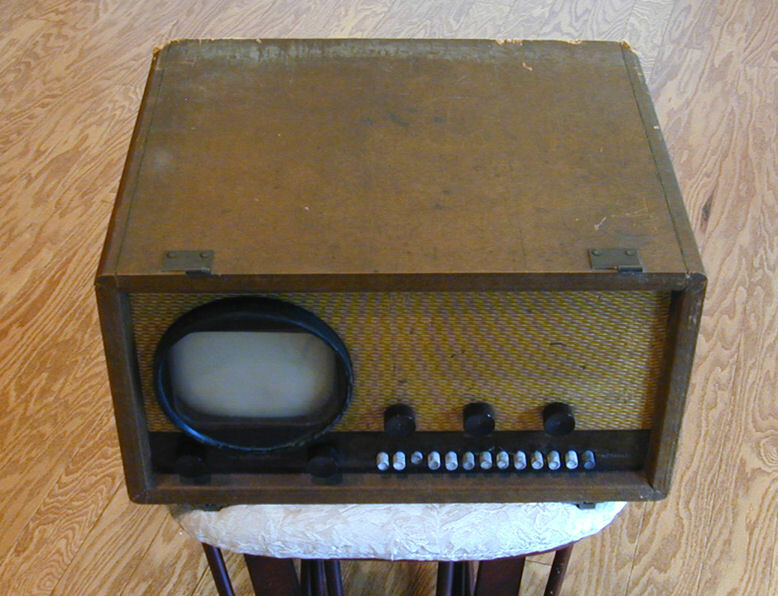 Like other 7-inch televisions and countless inexpensive radios, it has an "AC/DC" type design, with the tube filaments connected directly to the AC line. Puzzled by the lack of sound, I made a quick check of the audio output, touching the tip of my soldering iron to the center terminal of the volume control. The result was a loud buzz, indicating that this circuit, at least, was functional. Looking more closely at the sound circuitry, I noticed something surprising. Pin 1 of V10, the sound IF amplifier tube, was not connected to anything! Since pin 1 is the grid, or input pin for this tube, that explained the absence of sound. 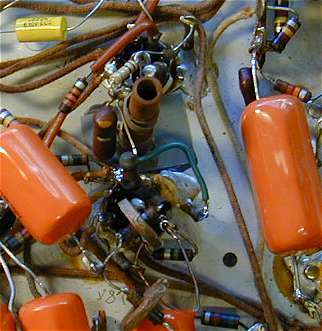 What's more, I saw another snipped-off lead on pin 5 of V8, the nearby first video amplifier tube. And a suspicious looking empty hole was located between those two tubes. The next photo shows this part of the chassis. Referring to the schematic, I discovered that someone had removed three coils and several other components, cutting off both the audio and video signals at this point. This was pretty discouraging, since I had no clear idea what the missing coils even looked like, much less how I might replace them. Calling on the rec.antiques.radio+phono newsgroup for advice, I soon learned that the missing coils were fairly generic in nature. One of the group members, Bonita Lee Geriac, was kind enough to scrounge me some replacements from a junked TV and send them in the mail. In addition to the parts, Bonita sent me instructions on how to install them, as well as a copy of the schematic for this version of the TV. (My schematic showed only the earlier version.) To make sure that I installed everything correctly, I made a drawing of the actual connections found in my TV, indicating how to install the scrounged components. Below is a view of the notes and the "new old" components. Two of the missing coils were peaking coils for the video signal. This type of coil is essentially a resistor with a coil wound around the resistor body. It is small enough to be wired point-to-point, as you would any small resistor. 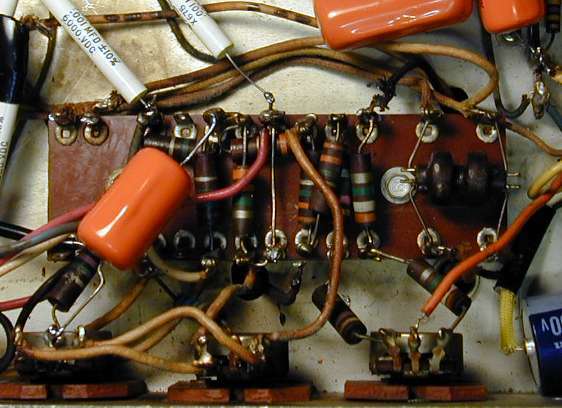 The third coil was a larger, adjustable coil, which couples the 4.5mhz audio signal to the audio circuits and also serves as a trap to prevent audio from leaking back into the video circuits, where it would cause interference. The mysterious hole between tubes V8 and V10 is where this coil had been mounted. Like other adjustable coils, it needs to be mounted with its adjusting screw accessible from the top of the chassis. I fashioned a small mounting plate from a piece of soup-can metal, cut to the right shape, epoxied to the chassis, and drilled with the correct size hole (5/16 inch) to fit the coil's clip. Carefully following my notes, I installed the new parts and cautiously powered up the set. For the very first time, I was rewarded with signs of life! The sound came through loud and clear on all local channels, and the fine tuning control affected the auio as expected. This was excellent news, since it meant some major chunks of circuitry were operational. The next two photos show the freshly installed components from below, and the sound takeoff coil from above the chassis. 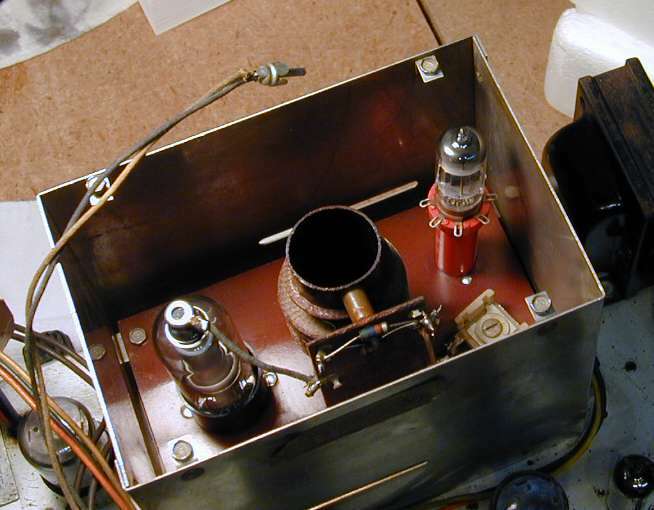 The upright brown cylinder near the middle of the first photo is the sound takeoff coil. The next phase involved replacing all of the remaining paper capacitors, including those hidden under the phenolic board in the base of the high-voltage cage. 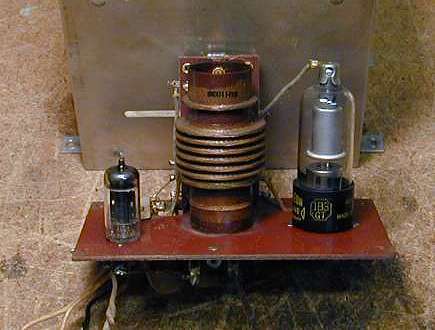 The high-voltage cage is located near the back of the receiver. 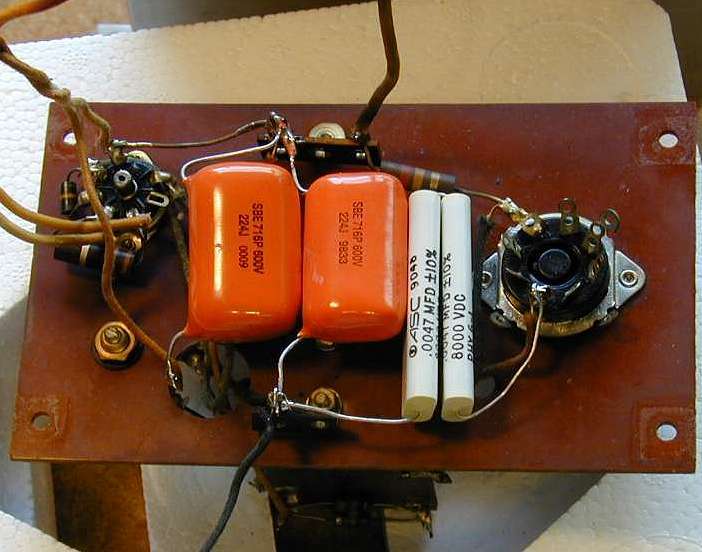 It contains the 6C4 HV oscillator tube, a 1B3GT HV rectifier tube, the HV coil, and a few other components. The next photo shows the cage from above, at a time when I had mounted the 6C4 tube in an extender socket for testing its voltage readings. To remove the high-voltage cage, you must carefully unsolder several leads which run through holes in the chassis to a phenolic board underneath. The next photo shows this board. After marking and unsoldering those leads, you can unbolt the cage from the top of the chassis and carefully draw it upward. Be careful not to yank too hard on the leads, which are stiff and will tend to bind in the narrow chassis holes. Then you can remove four screws inside the cage and take out the board itself. The next photo shows the high-voltage board removed from its cage. In the middle is the HV coil, which we'll return to later. Its complex construction with stacked windings makes it nearly impossible to replicate. Hidden under the HV board are three paper capacitors, as seen in the next photo. One of them is another 6000-volt rated capacitor. The following picture shows the HV board after recapping. Getting the h-v board back onto the cage is trickier than pulling it off. Threading the old, bent, stiff leads through the bottom of the cage proved almost impossible, even using a strong light and long, narrow tweezers. I solved the problem by tack-soldering each lead onto a long, thin piece of wire about two feet long, threading each wire through the appropriate hole, then carefully pulling the board with its leads back into the cage. After the board was bolted back in, I used the same procedure to thread the leads back through the chassis. Then I unsoldered the temporary wires and reattached the leads to their original terminals. Because this is a finicky procedure, you might be tempted to skip it altogether, but I advise against that shortcut. It's vital to replace the old capacitors in this cage if you want your set to work reliably. My Kingdom for a Raster! At this stage, I was getting desperate to see some kind of image on the CRT. Probably not a recognizable picture, but at least a glimmer . . . a horizontal white line . . . a dot in the center . . . something! All of the paper and electrolytic capacitors had been replaced, and I had restored the cannibalized circuitry as best I knew how. What a disappointment it was when I finally fired up the set and got exactly the same results as before. Great sound on all channels, not a hint of light on the picture tube, no matter how I adjusted any of the picture controls. Since it was nighttime, I turned off the shop lights to doublecheck that all the tubes, including those in the high-voltage cage, were lighting up. When I turned off the last light, I was amazed to see a faint image on the CRT. There had been an image all along, but it was so faint that even a single light in the room washed it out completely. Encouraged, I started fiddling with the picture controls, and soon had a watchable image. 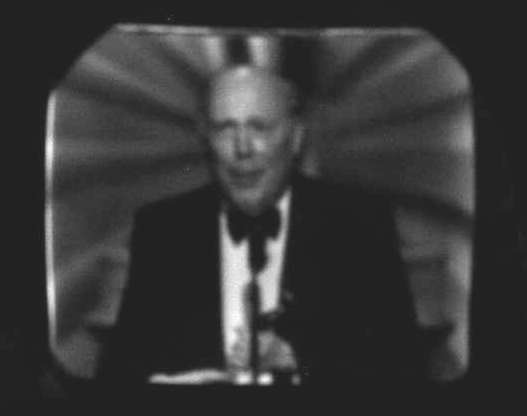 The next photo shows the CRT at this stage, displaying an image from the 2002 Academy Awards ceremony. Okay, so that's not the greatest picture you've ever seen! But if you have ever tried to fix an old tube TV, you know that almost everything in the set has to be working reasonably well, just to obtain even a feeble picture like this. I still didn't have a workable television, however. A picture that's invisible in normal room light is not acceptable. The next logical step was to test the set's high-voltage output. Caution: testing the high-voltage circuits on any television is potentially dangerous. Don't attempt it unless you have the correct equipment and some experience working around high voltage. You cannot use an ordinary voltmeter for such tests. I used a special high-voltage tester made by Pomona Electronics, shown in the next photo. The results were disappointing. Where the schematic indicates 5-6 kilovolts, I measured only 2 kilovolts. This alone might account for the dim picture. I spent some time rechecking my work and checking other components such as associated resistors, but found nothing suspicious. I even disconnected the high-voltage output lead and checked the voltage again, in case something was loading down the output. Inside the HV cage is a small trimmer capacitor that can be used to adjust the output. Adjusting this trimmer made no discernible difference in the output. I also used a frequency counter to determine the frequency of the high-voltage oscillator. Depending on the trimmer setting, I found that the best picture was obtained with a frequency between 185 and 200 KHz, a value that is consistent with this type of oscillator, according to my old TV manuals. Of course, a worn-out picture tube can also be responsible for a dim picture. Unfortunately, no CRT testers are capable of checking an electrostatic deflection tube. The only practical test is to try it out in a working TV that uses the same tube. I placed an ad on my website's free ad page (which has since been discontinued), seeking someone in the area with a working 7-inch TV. To my amazement, the ad was answered the very next day, by a fellow collector who owned a restored Hallicrafters 505 and who lived only about two miles from my house! I rushed over to the house to make the test. Before installing my tube, we powered up his working TV so that I could see how bright a normal picture should be. Then we slid the chassis out of the cabinet, installed my tube, and fired it up again. The picture was completely dark. Turning out all the lights, we saw a faint image, exactly as in my set. My CRT was clearly a dud. Over the next several weeks, I spent some time checking out the high-voltage power supply, which stubbornly refused to produce more than about 2 kilovolts. I also acquired a couple of fresh 7JP4 picture tubes and restored a Motorola VT-73, another 7-inch electrostatic deflection set. The final photo shows the TV in operation, using a strong CRT. It's watchable, but not the brightest of my 7-inchers, probably due to inadequate high voltage. The high-voltage supply in these Hallicrafters TVs (and similar Philco 7-inch sets) is problematical. 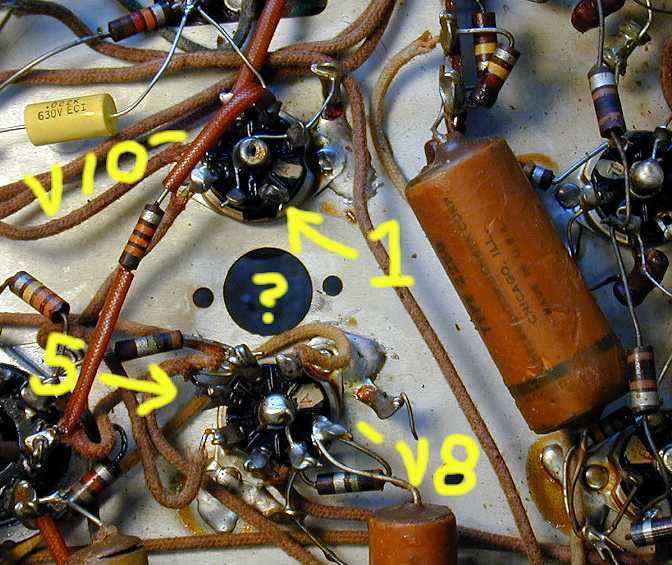 In many cases, including mine, merely restoring components to original values doesn't produce the required voltage. The culprit is the HV coil, which appears to lose its oomph over time, perhaps because it absorbs moisture. 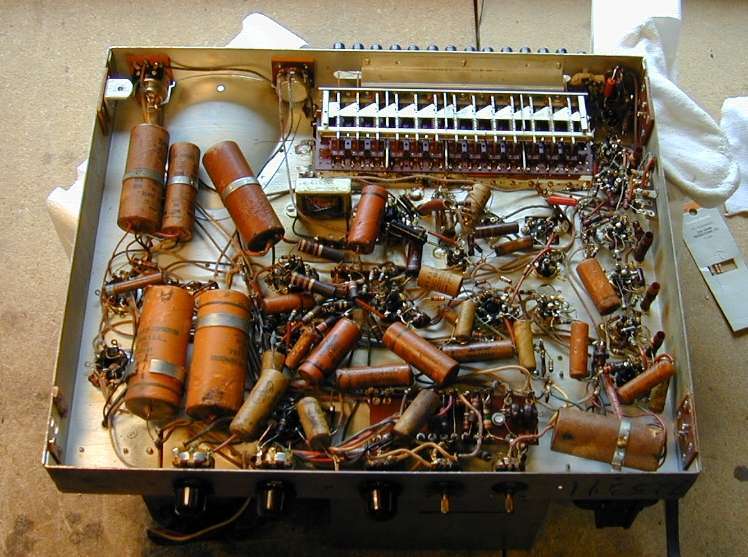 Collectors have tried various remedies, such as baking the coil and recoating it, modifying circuitry to boost the drive voltage, or even installing a substitute high-voltage supply. Tom Albrecht found a solution that seemed to fix the problem permanently. He installed a little muffin fan in the HV cage and lifted the lid a bit to improve ventilation. You can read more in his VideoKarma discussion. After finishing the Halli 505, I got yet another 7-inch TV, a 1948 National TV-7W. Read that article for some comparisons between these competing models. Or, How About a T-67? A couple of years later, I found another 1948 Hallicrafters, a 10-inch T-67 tabletop. Using a very different design, it makes an interesting contrast to the 505.